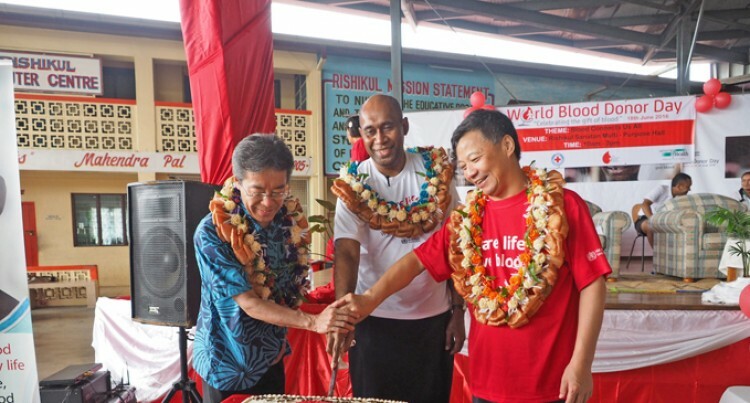 From left: Embassy of Japan in Fiji, counselor and deputy chief of mission Tsugushi Hada Ministry for Health and Medical Services Permanent Secretary Dr Maciusela Tuicakau and WHO Pacific Technical Support director/ Representative, South Pacific Dr Yunguo Liu celebrating World Blood Donor Day yesterday. Photo: Shahani Mala. Ministry of Health and Medical Services aims to meet 100 per cent voluntary blood donation by 2018. “Blood donors save lives every day through their blood donations,” he said. Dr Tuicakau said this during the World Blood Donor Day celebration at Rishikul High School in Nasinu yesterday. This year’s World Blood Donor Day celebration theme is ‘Blood connects us all’. “This year’s theme focuses on thinking blood donors and highlights the dimension of sharing and connection between blood donors and patients,” Dr Tuicakau said. “Blood is a highly perishable product with a very short shelf life of only 42 days at most. Therefore it needs to be replenished constantly in our blood banks,” he said. Dr Tuicakau said according to World Health Organisation (WHO), 180 million blood donations were collected globally; half of these were in high income countries. “WHO aims to have two to three per cent of the population to become blood donors so they can meet the nation’s most basic requirements of blood. “Every member state needs to achieve 100 per cent voluntary blood donation by 2020,” he said. Dr Tuicakau urged everyone to come forward and donate blood and save lives.